Warm, windproof, water-resistant the updated Nano Puff Jacket uses warm, incredibly lightweight and highly compressible 60-g PrimaLoft Gold Insulation Eco with 55% post-consumer recycled content, wrapped in a 100% recycled polyester shell and liner. Born of shoulder-season belay duty and quick-hit ski tours, the Nano Puff Jacket finds a home with any alpine climber or backcountry skier. 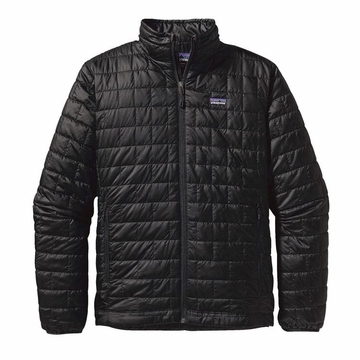 Its wind-blocking, 100% recycled polyester shell sheds moisture and glides effortlessly in your layering system. Low-bulk, hydrophobic, highly compressible 60-g PrimaLoft Gold Insulation Eco now with 55% post-consumer recycled content, and still the most thermally efficient synthetic insulation available traps heat with remarkable efficiency, even when wet. The jacket has a sculpted fit, with narrow horizontal quilting on the shaped side panels, and the soft, wicking interior storm flap and zipper garage add chin comfort. Its internal zippered chest pocket doubles as a self-stuff sack with a carabiner clip-in loop. It also has two zippered handwarmer pockets, elasticized cuffs and a dual-adjust drawcord hem to seal out wind and seal in warmth.